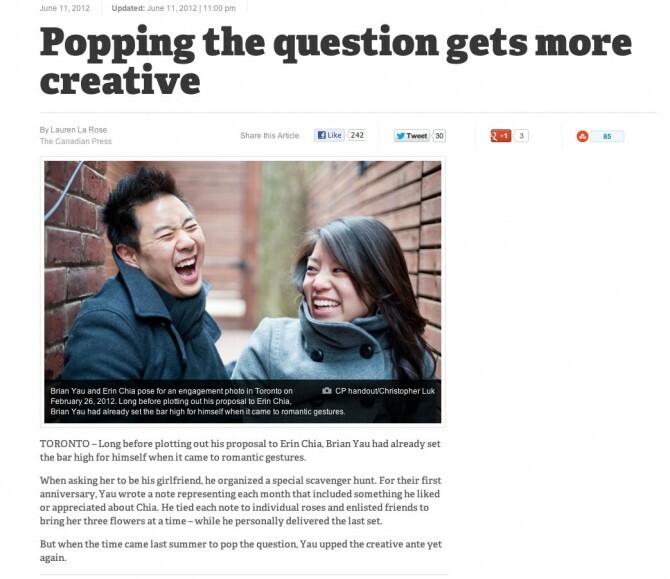 One day, I received an e-mail from Lauren La Rose of The Canadian Press, saying that she was working a on story related to unique wedding proposals. She noticed that I commonly feature the proposal stories of how my couples get engaged. Erin and Brian’s proposal story especially caught her eye. I love getting to know my couples, who they are, what they like, and what they do for fun. What I especially like hearing about is how they met, how they got together, and how they got engaged. In the way that they (or just he or just she) tells their story, I find that you really get to know their unique personalities and characteristics. For some, that means that it’s an intimate moment, for others, it means that it’s a moment shared in public — whatever the case, it’s always the best when it’s a reflection of your relationship, not someone else’s relationship. An important thing to note: small and intimate does NOT equal uncreative. In fact, a small and intimate proposal can be very creative and elaborate! Something like this might be perfect for you! Why do I share my couple’s stories with you? 1) They are real people with real stories: they’re not just pixels on a screen. 2) Their story is a significant and important part of who they are and their relationship: it’s significant and important to me as well. 3) To inspire men (and not discourage them) to love their significant other. Soon-to-be-grooms, be encouraged by these stories! As men, no matter how much we want to be lazy, do nothing, and don’t want it to be true, in healthy relationships, we set the attitude and altitude for the relationship. Sometimes we just need to be reminded and refreshed as to the important role we have. Even married men still have to pursue their wife, be creative, take her out for dates, and make sure that she feels loved! P.S. Did anyone see this article in the hard copy newspaper print version? I was out of town for the past few weeks, so I haven’t even held a newspaper in a while!